This is going to be a difficult goodbye. 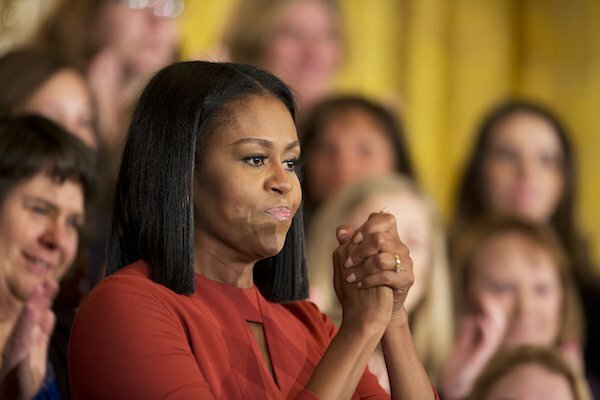 In her final speech as first lady today, Michelle Obama delivered a tearful message of hope to America’s youth — particularly immigrants — urging them not to give up and saying she’d be with them even after she left the East Wing. “Do not ever let anyone make you feel like you don’t matter or like you don’t have a place in our American story, because you do,” Obama said Friday during a White House event honoring school counselors. “Know that this country belongs to you,” she said. Just over two weeks before her husband’s term as president comes to an official close, Obama said that serving as the first lady has been “the greatest honor” of her life. Obama was a sharp critic of President-Elect Donald Trump during the campaign, arguing for a more inclusive and tolerant vision of America than the one he outlined. “Don’t be afraid,” she said. “Lead by example with hope, never fear. … And know that I will be with you, rooting for you, and working to support you for the rest of my life. Obama has made a point of working with children and youth throughout her time in the White House, and used her final official speech to say that she wanted to make sure they knew that they mattered and belonged. She also thanked all of her supporters from the past eight years. "I hope I've made you proud," she said.